Why do women change their names when they get married? I’ve heard the excuses. It protects the husband’s manhood, simplifies mailing addresses and form filing, makes parents happy, and symbolically unifies the family because the kids and parents all have the same last name. Oh yeah, it’s romantic. Here’s my first excuse. After the wedding invitations went out in 1993, gift checks began to arrive addressed to Mr. and Mrs. Jeffrey Gavin. I quickly realized that if Gavin weren’t somewhere in my name, I wouldn’t be able to cash these or future checks. Of course, checks stopped coming after the nuptials so a long-term solution wasn’t really necessary. Here’s my second excuse. We lived in a suburb of Detroit, Michigan, a half hour from the Canadian border and spent many Saturdays in Windsor. Again, I wanted Gavin somewhere on my legal documents so that I could prove that my yet-to-be-born child was mine – that I wasn’t a kidnapper smuggling some little darling over the border. Had I thought this through, I would’ve realized that a birth certificate would be required to take a child into Canada and I would clearly be listed as the mother of said child. I knew that I didn’t want to full-on lose my beautiful last name. Marinelli not only identifies me as an Italian-American, but it also holds my life story. Everything that happened up to that point, every accomplishment, mistake, joy and regret happened to Ursula Marinelli. I couldn’t lose that. Nor did I want to hyphenate. The first name, which would’ve been Marinelli, always gets dropped because two last names are more than this culture can handle. It also felt too indecisive. I finally settled on the perfect solution. Because I didn’t have a middle name, I decided to insert Gavin. I never actually use this middle name. I’m still Ursula Marinelli, but my driver’s license and passport bear the same name as my daughter and we were free travel the world. 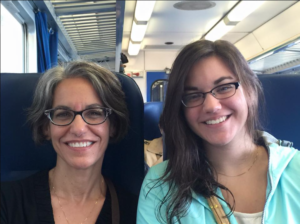 My daughter Domenica and I on an Italian train. Proof of parenthood no longer required. Now that I’m divorced, I plan to remove Gavin from my legal documents. It’s nothing against my ex, I just think it’s time to go back to being myself. I’d love to hear your name story. Did you keep it? Alter it? Why or why not? Any regrets? I’ve had 4 last names. I was born Tara Ann Garretson. At age 28 I married and became Tara Ann Hogan. I changed my name because that’s just what you do when you get married-right? I was a follower. Doing what society told me to do. Divorced and remarried at age 37 I did the same thing again -taking my new husbands name I now became Tara Ann Avery. Finally at age 56 having gone through yet another divorce I started the journey of being myself. A new name was called for. I legally became Tara Sky. I dropped the middle name because I never used it anyway. My birth family was baffled as to why I didn’t go back to my old name. “I’m a whole new person” I told them. I was moving forward and not looking back. I have 3 children all with different last names than me- sorta like different chapters of a book. I’m choosing to live my life in an ever expanding spiral of change instead of doing exactly what society wants me to do and be. And Being Tara Sky seems right for this time around the loop. Names, names. I’ve had a battle with my names all my life. I hated my original name, Julie Elizabeth Schenck. When I was in high school, I changed my first name to Ineka and dropped Elizabeth. When I was in college, I didn’t want to use my father’s name either, so briefly I was the glamorous Ineka. Just Ineka. It’s even on my college diploma. Then I had ALL SORTS OF PROBLEMS with only having one name, so I picked a name out of thin air, with only a second to choose, and it was Blue. Ineka Blue was born. Then I got married to my first husband. I wasn’t going to take his name and be his chattel! Nope. That marriage was brief, but I got very sick of having to remember whether the reservation or prescription or whatever was under his name or mine. When I got married again I took my husband’s name and all three of us had the same last name. I liked it. Now I’m getting divorced again and moving to Prague. Every time I tell someone there my name is Ineka they say, Huh, that’s a weird name. I told one of them my original name and he said that it was beautiful, and it was when pronounced the Czech way. It sounds kind of like Zhulia Lizabet. Isn’t that pretty? So, when I officially get a divorce, I’m actually thinking about going back to my original name. Especially when I found out that my mother had a baby very young who she gave up for adoption, but before she let the baby go, she named her Elizabeth. So now I am connected to my newly found sister by our names! But I can’t use a name not on my documentation while I’m living in Prague. It’s just not done. So it may be too confusing to change it at that point. That is fascinating Ineka. I had no idea that you invented your name. I’ve always loved it. Hmm. The man I married had the last name of Nixon, and with the associations it carried, it was easy for me to decline it. Of course, women of a certain age, like us, carry our father’s names anyway. Husband’s name or father’s name–doesn’t seem much different. But such a blow to them if we pick our own. A strange aspect of the patriarchy. I wonder how it feels to have everyone you live with have your name? Like a kind of colonization. I’m going to make that a condition for anyone who wants to live with me from now on — even my cats. I never think about changing my name. It’s probably because I’ve lived with my married name for 36 years now. I married young. I had just turned 23 and hadn’t had much life experience on my own, other than college. I liked the idea of being Mr. and Mrs. — a team, two parts of a whole. That’s what marriage is to me. I also thought his name was much more beautiful than mine. But, like you, I couldn’t completely let go of my family name. It was my father’s and I loved him dearly. So, like you, I just added. My new name . . . well you know. It’s (Virginia) Diane (Robinson) Marinelli. I joined that big Italian clan you came from and never looked back.